“I’m not an Eeyore; I’m a Pooh!” Netflix has released a new trailer for the fourth and final season of Unbreakable Kimmy Schmidt. The comedy centers on Kimmy Schmidt (Ellie Kemper), a young woman who moves to New York City after being rescued from a doomsday cult. The cast also includes Tituss Burgess, Carol Kane, Jane Krakowski, Jon Hamm, Fred Armisen, and Mike Carlsen. Season four of Unbreakable Kimmy Schmidt premieres on Netflix on May 30th. 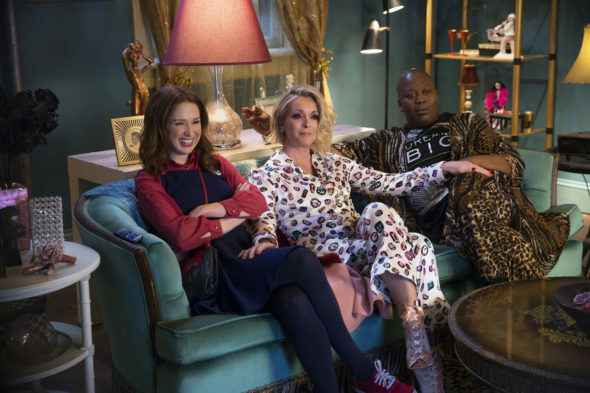 Ellie Kemper, Tituss Burgess, Jane Krakowski and Carol Kane star in Unbreakable Kimmy Schmidt. Reprised and new guest star roles for season four include (but are not limited to) Jon Hamm, Busy Phillips, Greg Kinnear, Bobby Moynihan, Amy Sedaris, Mike Carlsen, Derek Klena, Zosia Mamet and Aidy Bryant. What do you think? Are you a fan of Unbreakable Kimmy Schmidt? Are you excited for the new season? More about: Netflix TV shows: canceled or renewed?, Unbreakable Kimmy Schmidt, Unbreakable Kimmy Schmidt: canceled or renewed? Unbreakable Kimmy Schmidt: Is the Netflix TV Show Cancelled or Renewed for Season Four? Unbreakable Kimmy Schmidt: Season Three; Kimmy Wants More Education?